These Shooter Games are simple to play, they are with guns, or other objects to shoot at different targets. 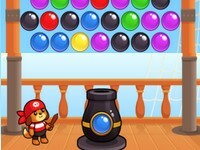 Launch different sized balls to knock the required amount of blocks off the screen. Play with Yeti and shoot to go through the obstacles and reach the target. A shooter game in which you play with a ball and many funny monsters. Bunker - Use your mouse to stop enemies before they get close. Raft Wars - Simon has discovered a treasure, help him to defend it. Sheep Bubble - With a sheep defend a sheepfold from wolves, throwing coolored balloons. Super Pitcher - Drop the ball in the indicated targets, avoiding other targets. Tunnel Rush - Choose between several types of machine ships and driving through a tunnel full of obstacles. Tommy Slingshot - Easy shooter and skill game in using the sling. Bubble Tanks 3 - Explore a world of spheres with a small cell like a mini-tank. Blosics 2 - Throw blocks off the stage by shooting balls at them. There are many types of blocks in 30 levels. Bloons 2 - Pop various bloon types from the original and some brand new ones like reverse gravity, monkey ace and camo bloons. Trickochet - Angle your shoot and drop the ball to the correct position so to get the target. Bloons 2 Spring Fling - A Shooter and Skill game, with spring backgrounds, where the goal is to break a certain number of balloons to each level. Santa Gifts Rescue - Shoot with precision and help Santa to collect all the gifts from the alien ship.